A pumpkin is a squash fruit, usually orange in colour when ripe. 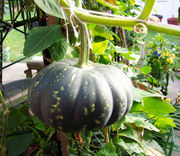 Pumpkins grow as a gourd from a trailing vine of the genus Cucurbita Cucurbitaceae. Cultivated in North America, continental Europe, India and some other countries, as well as in English cottage gardens, Cucurbita varieties include Curcurbita pepo, Cucurbita maxima, Cucurbita mixta, or Cucurbita moschata — all plants native to the Western hemisphere. The pumpkin varies greatly in form, being sometimes nearly globular, but more generally oblong or ovoid in shape. The rind is smooth and variable in colour. The larger kinds acquire a weight of 40 to 80 lb (18 to 36 kg) but smaller varieties are in vogue for garden culture. Pumpkins are a popular food, with their insides commonly eaten cooked and served in dishes such as pumpkin pie; the seeds can be roasted as a snack. Pumpkins are traditionally used to carve Jack-o'-lanterns for use as part of Halloween celebrations. Botanically it is a fruit, referring to a certain plant part which grows from a flower. However it is widely regarded as a vegetable in culinary terms, referring to how it is eaten. Butternut squash is called "butternut pumpkin" in Australia, and "neck pumpkin" in parts of Pennsylvania where it is commonly regarded as a pumpkin and used in similar ways to other pumpkin. Pumpkins growing in a field. Pumpkins have male and female flowers, the latter distinguished by the small ovary at the base of the petals. The flowers are short-lived and may open for as little as one day. Pumpkin chucking is a competitive activity in which teams build various mechanical devices designed to throw a pumpkin as far as possible. Catapults, trebuchets, ballistas and air cannons are the most common mechanisms. Some pumpkin chuckers grow special varieties of pumpkin, which are bred and grown under special conditions intended to improve the pumpkin's chances of surviving being thrown. 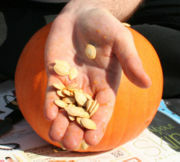 The hulless or semi-hulless seeds of pumpkins can be roasted and eaten as a snack, similar to the sunflower seed. The seeds are often prepared by separation from orange pumpkin flesh, mixture with a generally salty sauce ( Worcestershire sauce, for example), even distribution on a baking sheet, and oven-heating at a relatively low temperature for a long period of time. They are a good source of essential fatty acids, potassium, and magnesium. In Latin America, the seeds are often greenish in colour and known as pepitas. One of the typical pumpkin products of Austria is pumpkin seed oil. When ripe, the pumpkin can be boiled, baked, and roasted, or made into various kinds of pie, alone or mixed with other fruit; while small and green it may be eaten in the same way as the vegetable marrow. It can also be eaten mashed at autumn holidays or incorporated into soup ( Sample Recipe). When you pour milk in a pumpkin and bake it, it makes pudding. The pumpkin is related to the zucchini (courgette). Pumpkin growers often compete to see whose pumpkins are the most massive. Festivals dedicated to the pumpkin and these competitions are relatively widespread and some form tourist attractions in their own right, for example in Half Moon Bay, California. The largest pumpkin ever grown weighed 1,469 lb (666 kg). Raised by Larry Checkon from Northern Cambria, Pennsylvania in 2005, it is technically a " squash," Cucurbita maxima, and was of the public variety " Atlantic Giant," which is the "giant" variety - culminated from the simple hubbard squash by enthusiast farmers through intermittent effort since the mid 1800's. However, this record is being challenged by Ron Wallace of Rhode Island, who raised an alleged 1,502 pound pumpkin in 2006 . Pumpkins are orange because they contain massive amounts of lutein, alpha- and beta- carotene. These nutrients turn to vitamin A in the body. 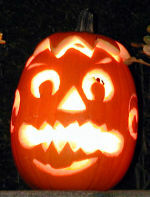 Using pumpkins as lanterns at Halloween is based on an ancient Celtic custom brought to America by Irish immigrants. All Hallows Eve on 31 October marked the end of the old Celtic calendar year, and on that night hollowed-out turnips, beets and rutabagas with a candle inside were placed on windowsills and porches to welcome home spirits of deceased ancestors and ward off evil spirits and a restless soul called "Stingy Jack," hence the name "Jack-o'-lantern". The city of Boston, Massachusetts currently holds the world record for most lit pumpkins in one area: 30,128, set on October 21 2006, beating out the previous record of 28,952 set in Keene, New Hampshire in 2003. Illinois produces more pumpkins than any other state in the United States; Michigan is a distant second. "Pumpkin" is sometimes used as an affectionate term, often referring to one's significant other. For example: "I love you, Pumpkin." The pumpkin is the state fruit of New Hampshire.